Mother of blind daughter receives signage as a gift after city wouldn&#39;t put up the &quot;Blind Child Area&quot; sign. INDIANAPOLIS — After years of fighting with the city, an Indianapolis woman has finally received a sign to inform drivers in the area to use caution for her blind ten-year-old daughter. Pauline Valvo had been told by the City of Indianapolis that federal guidelines prohibited any new signage . 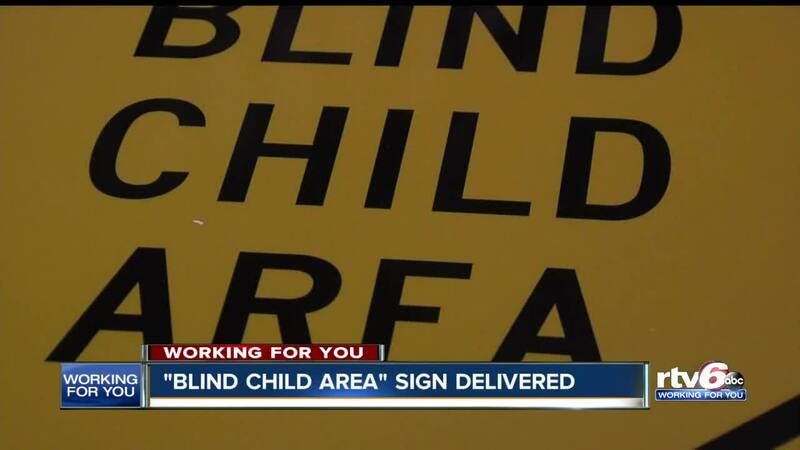 A month later, the mother was told that if she wanted a sign that read "Blind Child in Neighborhood” on her street she would have to purchase and install it herself. RTV6 has covered Valvo’s story multiple times over the last couple months – and today RTV6 arrived with a box that contained the sign Valvo had been fighting for. Angela Combs Eads saw the RTV6 story with Valvo saying she wanted a sign because she wanted Stella to be able to safely walk around her community. “My grandfather was blind most of his life and my mother-in-law's name is Stella, and I work for a sign company and I just felt like it was a sign that I need to do something,” Eads said. Eads, who works at Hall Signs Incorporated, became involved after RTV6 asked the city to install the sign. “I hope Stella continues to find her independence,” Eads said. The city said Valvo could install a sign if it was no taller than four feet, the surface area is less than four feet, it’s not in the right of way and it’s not illuminated. RTV6 has ordered a utility location for Valvo and the sign will be installed later this week. The sign will let people know to use extra caution when they’re driving through the near north side and is only meant to raise awareness . This is not enforceable under the law.